Depending on what model of water heater you happen to own, your annual investment in hot water may range anywhere from several hundred to several thousand dollars. Did you know that the freezing temperatures of Canada’s winter can damage not only your water pipes but also your hot water heater? This holds true whether you have a traditional tank water heater or a tankless model. If you don’t know how to protect your hot water heater during the cold season, you open yourself up to costly repairs or even a full replacement. In this post, we walk you through how to protect your hot water heater, water pipes and household or workplace hot water supply this winter. Whether your hot water heater is a tank or tankless model, there is no escaping the contracting effect that extremely cold temperatures have on the unit itself. While most new units are constructed to withstand temperature ranges in the area(s) where they are sold, older units can be more vulnerable to leaks, cracks and breakage from prolonged exposure to extreme temperatures. As well, while many new units have built-in freeze protection, older units are less likely to have this feature. Regardless, if a unit of any age is likely to be exposed to sub-freezing temperatures, draining is the only sure way to protect it from cold damage. Each of these issues can be a symptom that your hot water heater has sustained some level of damage from cold exposure. Small leaks can often go undetected at first. But over time, the exposed metal may begin to rust, and this rust can leach into your water supply itself. If you start noticing that your water is discolored or has a strange taste, this is one warning sign to investigate. Another sign that your hot water heater—tank or tankless—has sustained structural damage from cold exposure is visible warping, bending, bulging, cracking or contraction/expansion in or around the unit or exterior components. If your hot water heater is having to work harder to heat the water, increasing energy costs can be another subtle symptom that it has leaks or cracks that are allowing heat to leach out. Sometimes this is the first sign your hot water heater may be compromised from cold exposure. If you notice that the temperature of your hot water fluctuates from one day to the next, this can be a sign that there is a leak or other issue somewhere within the water delivery system. Hot water heaters have their own language to communicate with you that all is not well. Banging, crashing, clanking, popping, knocking and other “mystery” noises can indicate there has been damage somewhere within the unit or along the water conduit system. Can You Prevent Cold Exposure Damage to Your Hot Water Heater? The good news is that there are preventative actions you can take to protect your hot water heater investment from cold exposure damage. One of the hands-down best preventative measures is annual preventative inspection and maintenance service. When you book, your technician will do a thorough inspection of the exterior and interior of your unit, do a thermostat accuracy test, flush and clean the unit, and ensure there are no cracks or leaks. Another great preventative measure all homeowners and business owners should take is to insulate their water pipes and their hot water unit (especially tank models). Not only does adding insulation increase heating efficiency and provide more control over winter energy bills, but it guards against cold exposure damage to the unit and pipes. Depending on what model of hot water heater you happen to have, it is important to clean and (if necessary) flush out your hot water heater unit at least once per year. This also gets rid of mineral build-up, removes any waste matter and gives you the chance to check your unit’s operation. This routine cleaning service can also be done as part of your annual professional preventative maintenance if you prefer. In addition to inspecting and maintaining your hot water heater unit, insulating the unit and watching your energy bills and water temperature fluctuations, it is critical to protect your water pipes from freezing. 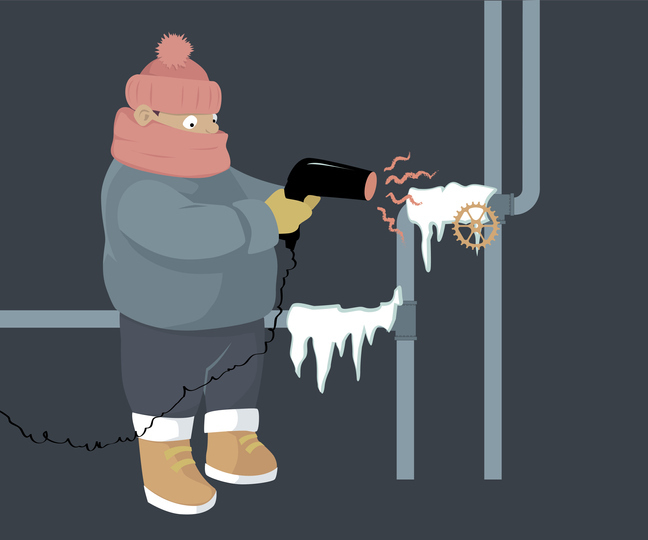 You are probably aware of the need to wrap pipes in advance of a hard freeze. But there are other protective measures you can take as well. The most protective action you can take is to drain your pipes and hot water heater if a prolonged hard freeze is expected. To do this, turn off the main water supply valve and open all of your faucets to drain the water out. Another option is to leave at least one faucet open at a drip to keep the water moving through your pipes. While it is always tempting to program your thermostat to take advantage of times when no one is at home to save some money on heating costs, this can backfire in freezing temperatures and expose your pipes to freezing and cracking. This is especially important to remember for seasonal cottages! Here at Shipton’s Heating & Cooling, we have nearly a full century of HVAC industry expertise installing, maintaining and repairing residential and commercial HVAC systems.